Found it at 79, 69 at Gull Rock. The previous posts are misleading, especially with the assertion that grappling is required. Following these instructions lead my friend and I way off course, and plummeting to our deaths twice. More accurately, the Orphaned Direbeak can be found at 79.79, 69.59 (/way Stormheim 79.79, 69.59 Orphaned Direbeak), and it is easy to jump down from around 79.62, 69.21 (/way Stormheim 79.62, 69.21 Drop from here) Hope this helps and avoids any further confusion! Pet requires Pungent Vrykul Gamalost. This is sold by the Innkeeper in Valdisdall (nearest FP). You have to kill Direbeak Matriarch and loot the corpse first in order to see Orphaned Direbeak. If you get to the cliff above where it's located (where you're supposed to jump down) and it doesn't seem to be there (and you've killed the Matriarch), just jump down anyway. You can't see it unless you're in the world quest active area. It'll reappear once you're on the rock. Perhaps there are different spawn points, but I was frustrated by the current comments on here because they seem only to refer to the matriarch, not the position of the Orphaned Direbeak. He is up on a rock at 79.6, 69.6.If you're facing the rock from below, go left, and you'll see the ramp that leads up behind, and then you can jump down and get the pet. You'll need a Pungent Vrykul Gamalost. I was not able to see the orphaned direbeak in the area mentioned by other commenters. I killed and looted the matriarch twice, once before the quest was completed and once afterwards. I jumped down to the rock at the coordinates indicated and there was no direbeaks. I found a passage to the right that led into a crack in the rocks, but it appears that is not actually intended to be a path because I ended up in a pit that was behind the rockface. To the left there was a lower platform and I tried going down to that instead and no direbeak was present. There may be an issue with the spawning of the direbeak. Step 1: Don't forget to buy the food! This particular creatures enjoys Pungent Vrykul Gamalost. If you forgot, Riala the Hearthwatcher (the innkeeper in Vladisdall) sells some. Then find your new friend. Most frustrating for me was not being able to see how to get to the "rock above the orphaned direbeak" in order TO jump down. Head counter-clockwise around the shoreline until you get to the vrykul ship that's run aground around all the lil bildgefin murlocs at which point you'll be able to head inland and up into the rocks overlooking the quest area. As others have mentioned, there can be phasing issues in seeing the direbeak from the cliff, but jumping down anyway should serve you alright. Once you've killed the matriarch, follow the path north leading away from the beach, where the goats are. Look down the cliff to the east and you'll see the rock below on the beach (its in screenshots) where the pet spawns. You have to jump down on to the rock to see the pet. You won't see it standing on the cliff. Good luck! Make sure your pet journal isn't full. I fed the orphan while my journal was full and it didn't get added. Now I can't spawn the orphan again. Opened a ticket but they wouldn't help either. Follow the shoreline in the quest area up north until the land juts out eastward into the water and makes what is almost a lagoon. You're aiming for the north edge of said lagoon, and you will be almost Due East of the Halls of Valour. You will see, on the inward edge of the cliff on the land side, a rather flat rock. You cannot get onto this rock from the shore. You must go around. This post is only to show you the location of this rock. The Direbeak Hatchling will be atop it. Here you go give upvotes. finding this thing was the worse trying to follow coordinates when your not using some add-on is a bit hard. I finally found this Orphan by killing the Matriarch first, meeting the requirements ect, then its real simple, Run back up the coast line as if your heading back towards that "murloc" area, but take the path closest to the mountain where you will see where some goats are spawned. The very tall rock that is there creating the "arch" go to that corner and drop down and the little bird is on the rock below that cliff where the goats are spawned. To be precise the cords were 79, 69 or w.e it said above, but you need to be up on this Goat spawning cliff to jump down to get to it. No grappling needed. You have to jump onto the rock at 79,69 and you can't see the hatchling from on top of the cliff.... you won't see it until you jump down onto the rock. If this spawns and you don't have the food in your bag, you can go to Valdisdall, buy it from the innkeeper there and fly back. The pet will still be there! Ok never posted a comment on Wowhead but figured out how to make your orphaned pet appear, when you get that bug where it doesn't. You go to the location, log off (make sure you not in a party), then log back in, it will appear as you'll be on your server. Anybody able to find this guy since prepatch 8.0? Killed the Matriarch, got the right food. No Orphan is spawning. 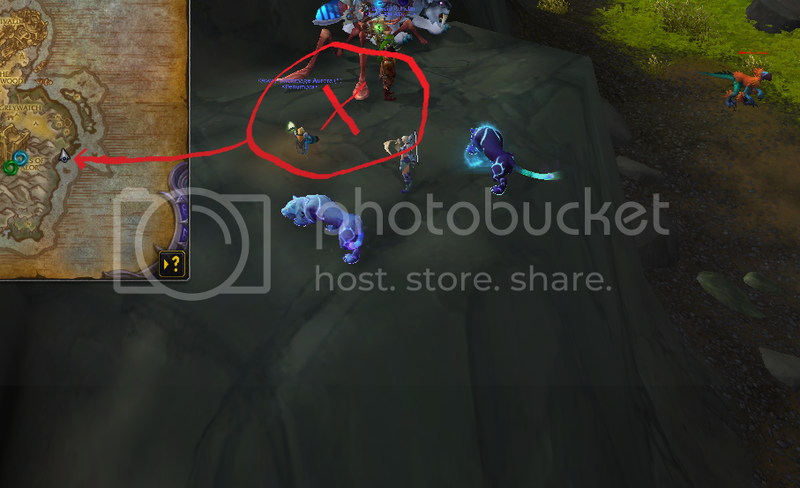 Seems you can only see this pet with Warmode on (PvP mode on) as of Patch 8.01. Tested it today with 4 characters, able to find the pet right away when Warmode was enabled. Pet was missing with Warmode disabled.